The number of Turkish soldiers dispatched to northern Syria exceeded 30,000 in the areas within the scope of the Euphrates Shield and Olive Branch operations and Idlib. 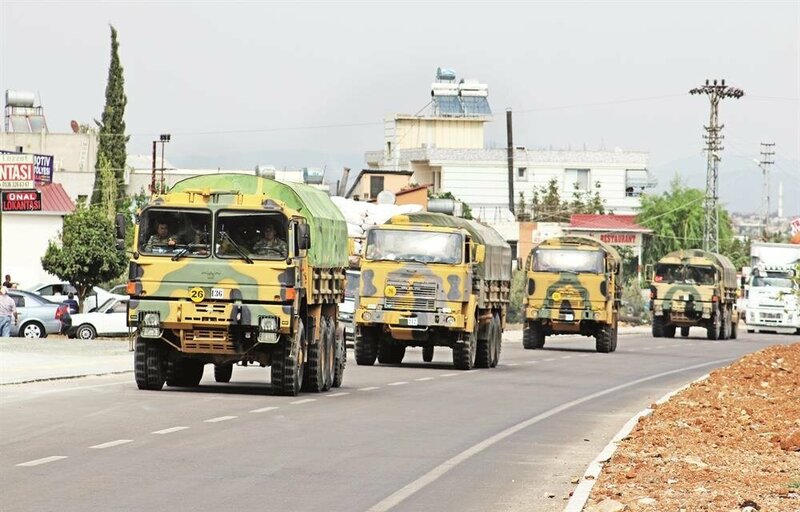 The Turkish army also doubled its armored vehicles and tanks deployed at the Syrian border and dispatched missile platforms, artillery batteries at strategic points. Turkish forces are present at 12 points from Idlib's north to south, which are currently being fortified with cement walls and bulletproof watch towers against a regime attack. The UN warned earlier this week that such an offensive would lead to the "worst humanitarian catastrophe in the 21st century." Military reinforcements arrived at the Syrian border in Turkey's southern Kilis province on Monday. The military vehicles were transferred to troops on the Syrian side of the border. Turkey also requested that the Free Syrian army report and list their number of troops, weapons and ammunition. 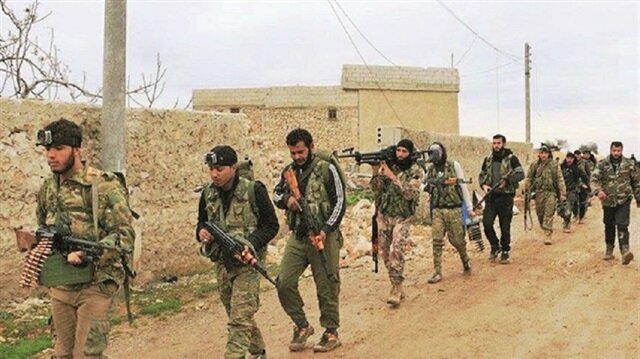 The FSA currently has 30,000 troops under the banner of the “Syrian National Army” in the areas within the scope of the Euphrates Shield and Olive Branch operations and will transfer 20,000 of them to Idlib. The National Front for Liberation, which was formed in May in northwestern Idlib and includes eleven opposition groups, has also a total of 30,000 fighters. The formation includes the following groups: Sham Legion, Jaysh al-Nasr, Free Idlib Army, 1st Costal Division, 2nd Costal Division, 1st Division, 2nd Army, Army of Elites, Shuhada al-Islam Darayya, al-Hurriyat Brigade, and 23rd Division. These groups have been operating in Idlib and the northern part of Hama under the banner of the Free Syrian Army. Turkey will not be responsible for a migration wave in case of possible attacks on Syria's Idlib, Turkish interior minister said on Sunday.Süleyman Soylu was speaking to reporters in Yayladagi district of Turkey's southern province of Hatay bordering Syria.The Syrian regime has recently announced plans to launch a major military offensive in the area, which has long been controlled by various armed opposition groups.The UN warned earlier this week that such an offensive would lead to the "worst humanitarian catastrophe in the 21st century".Assad regime, Russia resume Idlib air strikesRussia mistaken in backing Assad: Ex-Syria PM"255,300 Syrians have returned to their homes over the past 2 years, 160,000 of them returned to Euphrates Shield region after Turkey brought peace there", Soylu said.Euphrates Shield cut off the PKK/PYD/YPG terror groups' access to the Mediterranean Sea and eliminated threats posed by the terrorist group along the Turkish-Syrian border.Operation Euphrates Shield, which began on Aug. 24, 2016 and ended in March 2017, was aimed at eliminating the terrorist threat along the border in the northern Syrian regions of Jarabulus, Al-Rai, Al-Bab, and Azaz with the use of the Free Syrian Army, backed by Turkish artillery and air cover.Slamming so-called big countries about their approach on the Syrian crisis, the interior minister said there is a major contradiction in what those countries say and do regarding the issue.Meanwhile, Soylu also noted an average of 6,800 irregular migrants used to enter Greece from western Turkey daily in 2015 and now it has been reduced to 79.Turkey has been a main route for irregular migrants trying to cross into Europe, especially since 2011 when the Syrian civil war began. The Arab media has highlighted the remarks of Turkish President Recep Tayyip Erdoğan about avoiding a "potential catastrophe" in Syria’s northwestern Idlib province in its coverage of the outcome of the tripartite summit.The Bashar al-Assad regime recently announced plans to launch a major military offensive in Idlib, which is controlled by various armed opposition groups.On Friday, the leaders of Iran, Russia and Turkey met in Tehran to discuss the situation and planned an offensive in Idlib by the Assad regime. "The Syrian conflict will end only through a political process," the Qatari daily Al-Sharq reported Saturday.European media covers Turkey's call for truce in IdlibTurkey's Syria policy based on 'humanitarian diplomacy'"Erdogan calls for resolving the issue of Idlib without catastrophe," the newspaper said, referring to the Turkish president's speech in which he gave utmost importance to the protection of civilians in the region.The Qatari newspaper Al-Watan gave coverage under the title "Turkish president stresses the need to resolve the issue of Idlib without new tragedies and tensions". "Turkey will not be a partner and a spectator" if the killing of tens of thousands of innocent people gets ignored in the interest of the Syrian regime, Erdogan was quoted as saying. "We will not accept to leave Idlib at the mercy of the Assad regime," Al-Watan quoted Erdogan in another coverage of the summit.In its follow-up to the summit, the Qatari newspaper Al-Raya also printed several prominent headlines, including "the conclusion of the Tehran tripartite summit with an agreement to address the situation in Idlib".Also, the London-based Al-Araby Al-Jadeed used the title “the tripartite summit ends in Tehran amid divergence over Idlib”.Qatar's Al Jazeera led its coverage of the summit with “Erdogan on Idlib: We won't watch from the sidelines”.Iraq’s state-run Sabah newspaper reported that Erdogan said the next summit will be in Russia, asserting that Ankara will not spare any effort to achieve stability in the region.Al Nahar Lebanese daily newspaper said in its title “Countdown in Idlib after failure of Tehran summit”.“The day after the failure of a summit in Tehran, fears have risen of an attack by regime forces and the new humanitarian disaster that will ensue in the last stronghold of the opposition where three million people live,” the newspaper said.Egypt’s flagship Al-Ahram covered the summit under the title: “In the Tehran summit, divergence about the fate of Idlib and agreeing on rejecting the U.S. presence.”Located near the Turkish border, Idlib is home to more than 3 million Syrians, many of whom fled from other cities following attacks by regime forces. Russia and Assad regime have escalated their attacks on Syria’s Idlib and shelled 58 separated points in the last two days alone. At least 29 people, the majority of whom are civilians, were killed in land and air strikes in the towns of Idlib’s Jisr al-Shughur, Sahel Al-Gab and Morek. An attack on Syria's Idlib, the last opposition-held stronghold, would be a massacre and the upcoming summit in Tehran, which will be attended by the leaders of Iran, Russia and Turkey, will yield positive results, Turkish President Recep Tayyip Erdoğan told reporters on the plane back from an official visit to Kyrgyzstan.“Turkey is working with Russia and Iran. Turkey has 12 observation posts in Idlib, and our security forces are resolutely carrying out their duties. There are 3.5 million people [in Idlib]. God forbid, if this area is hailed by missiles there would be a grave massacre. In that case, where would those fleeing go to? The majority would come to Turkey. This could give rise to a new issue,” Erdoğan said.“Apart from Idlib, be it regarding Tell Rifaat or Manbij, our efforts are ongoing. The Tehran summit will be held on Sept. 7. We will carry this issue to a positive point with the Tehran summit, which is a continuation of Astana. I hope we will be able to prevent the Syrian government's extremism in this region,” he added.Russia and Turkey, along with Iran are sponsoring the Astana peace talks, which focuses on a cease-fire and ending the seven-year civil war in Syria.UN aid chief fears worst humanitarian crisis in IdlibManbij roadmap not proceeding as plannedErdoğan stated that the road map for the northern Syrian city of Manbij agreed between Ankara and Washington in June is not proceeding as planned.“I can say that we are not at the point discussed by our foreign minister and [his U.S. counterpart] Mike Pompeo regarding Manbij. It is being neglected. We are not at an ideal point. Unfortunately the agreement made is not going forward in the same direction as the initial discussions. I hope that we will enter a new phase with the meetings our Foreign Minister [Mevlüt] Çavuşoğlu and our Defense Minister Hulusi Akar will hold with their counterparts,” Erdoğan said.Under the road map for Manbij agreed by the two NATO allies, Turkish and U.S. forces are now carrying out joint patrols to clear the area of the YPG.In a meeting on Tuesday, Turkish Defense Minister Hulusi Akar and the U.S. special representative for Syria, James Jeffrey, discussed the developments in Syria.Russia says in contact with Turkey regarding northern Syria“Right now, the situation in Idlib is of critical importance for us. A ruthless process has been going on there. God forbid, if disaster strikes, the first place they will be able to flee to is Turkey. Now such a risk is on the agenda at a time Syrians [in Turkey] have started to return,” Erdoğan said.Idlib, located in northwestern Syria on the Turkish border, has faced intense attacks by the Bashar al-Assad regime after a vicious civil war broke out in 2011. Since March 2015, Idlib is no longer under the control of the Assad regime and has been overrun by opposition groups.The Assad regime is currently preparing for an offensive to recapture the region.UN envoy urges Erdoğan, Putin to discuss IdlibTurkey-U.S. tiesThe Turkish president also said that U.S. President Donald Trump had not requested a meeting on the sidelines of this month’s UN general assembly, and that he would not submit a request either.Regarding the case of U.S. pastor Andrew Brunson, which has caused relations between Ankara and Washington to sour, Erdoğan said that Turkey cannot fulfill "unlawful requests.” Erdoğan added that Turkey followed the rule of law and the U.S. would not be able to make progress in the case by using threats.“As another example, we can look at the situation of Halkbank executive Hakan Atilla. He entered the U.S. six times, and they arrested him as he was leaving from his seventh visit. Halkbank doesn’t even have a branch in the U.S. What is the crime of Halkbank or its executive? There is no clear evidence. The law is not important for them [the U.S.]. They say that they are mighty, and therefore right,” Erdoğan said.Turkey expects no fine for Halkbank: FinMinA U.S. law firm hired by Turkey to look into state-owned Halkbank's dealings with Iran found that it did not violate U.S. sanctions. Law firm King and Spalding and data firm Exiger carried out the investigation after a Halkbank executive was charged in New York last year with taking part in a scheme to help Iran evade U.S. sanctions. The executive was found guilty and sentenced in May to 32 months in jail, a decision which Turkey said was politically motivated.Erdoğan hails new U.S. special representative for SyriaErdoğan lauded the new U.S. special representative for Syria, James Jeffrey, who met with Foreign Minister Mevlüt Çavuşoğlu and National Defense Minister Hulusi Akar on Tuesday in Ankara.“I believe Mr. [James] Jeffrey’s appointment is on point. During my visit to the U.S., I had met with him. I believe his appointment is so sagacious it cannot be compared to the previous envoy, who has not been taken off duty and is still active in the region. I hope his appointment will benefit this new process, and that it will enable some steps to be taken quicker,” Erdoğan said.Turkey tells US that YPG/PKK must leave SyriaTurkey-EU relations“Unfortunately, the EU has not responded to the positive steps Turkey has taken. We still have not received reciprocation. Many decisions were always postponed. From free movement to aid promised for refugees, we want to surpass these matters so that we can see ahead,” Erdoğan said.In 2016, Turkey and the EU signed a deal aiming to stem the irregular migration flow through the Aegean Sea by taking stricter measures against human traffickers and improving conditions for nearly 3 million Syrian refugees in Turkey.Turkey has long complained of the EU being slow to deliver the promised funds for refugees and failing to uphold its end of the deal concerning visa-free travel.Erdoğan’s upcoming visit to Germany“The EU, apart from a few exceptions, is not at the point we desire. I will make an official visit to Germany following the invitation of the president [Frank Walter Steinmeier]. The visit will also give me the opportunity to meet with [chancellor] Angela Merkel. There are many matters that must be evaluated regarding Turkey-Germany relations. There are over three million Turks in Germany. I place great importance upon this visit, which will give us the opportunity to discuss many issues face to face. Germany has a very critical position in the EU, and is virtually a leader,” he added.Macron should conduct return visit to Turkey“France seems more positive, but [French President Emmanuel] Macron did not conduct a return visit, and he should. We hold meetings and phone calls in order to make moves, but their approach regarding the developments in Syria are not too good. We cannot say that the approach of the Netherlands or Belgium is too good,” Erdoğan said.The Turkish president had visited France in early 2018. “An attack on Syria's Idlib, the last opposition-held stronghold, would be a grave massacre,” Turkish President Erdoğan said ahead of the Tehran summit that was held as a part of the Astana process, which aims to find a lasting solution to the turmoil in Syria. The presidents of Iran, Russia and Turkey gathered in Iran's capital Tehran on Friday to discuss the fate of the opposition-held province of Idlib.